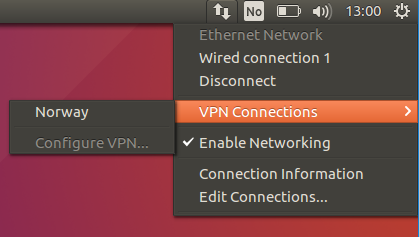 Find the network-settings in the menu, and edit connections. Import and save the configuration. Go to our server config database and select what site you want to connect to, or the bundles zip file. Unzip the file and there should be ovpn config files and a certificate. Import a configuration from your download folder. Insert your username and your password and select Save. 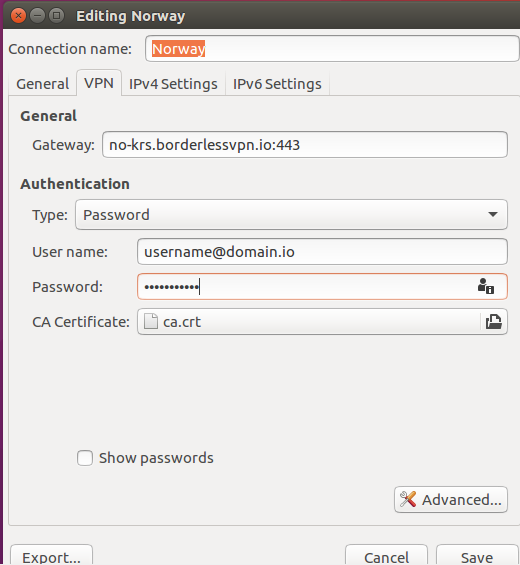 Now there should be a new VPN connection in the network-manager. Select “Norway” (or any other site you have added) and you should be connected. You can also confirm that everything is connected by checking if there is a tun0 network-interface available.